Star, an Arabian in his mid-20’s, was originally rescued by Heaven Can Wait in August of 2008 because he was the old man in a group of too many horses. He was in foster care until January 26, 2011. Due to time constraints of the foster family, Star was not receiving the attention he needed and so it was time to bring him to the Sanctuary. He fit in with the herd and their routine immediately and, with a little more work, will join the others as a “therapy” horse. We are glad he is here. 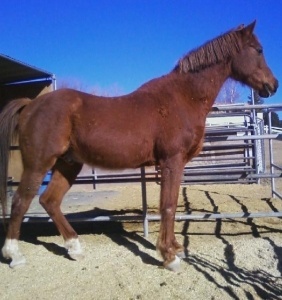 He is a nice horse with a good personality who loves all the attention he is now receiving.